returning from an Atlantic cruise, October 1938. The Deutschland class was a series of three Panzerschiffe ("armored ships"), a form of heavily armed cruiser, built by the Reichsmarine officially in accordance with restrictions imposed by the Treaty of Versailles. The class, which comprised the ships Deutschland (renamed Lützow later), Admiral Scheer, and Admiral Graf Spee, were all stated to displace 10,000 long tons (10,000 t) in accordance with the Treaty, though they actually displaced 10,600 to 12,340 long tons (10,770 to 12,540 t) at standard displacement. Despite violating the weight limitation, the design for the ships incorporated several radical innovations to save weight. They were the first major warships to use welding and all-diesel propulsion system, a radical innovation at the time that contributed to significant savings in weight. Due to their heavy armament of six 28 cm (11 in) guns, the British began referring to the vessels as "pocket battleships". 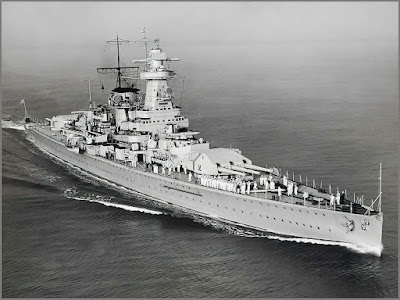 The Deutschland-class ships were initially classified as Panzerschiffe or "armored ships", but the Kriegsmarine reclassified them as heavy cruisers in February 1940. The three ships were built between 1929 and 1936 by the Deutsche Werke and Reichsmarinewerft in Kiel and Wilhelmshaven, respectively. The three Deutschland-class ships varied slightly in dimensions, appearance and armament. The Admiral Graf Spee was confronted by three British cruisers at the Battle of the River Plate. Although she damaged the British ships severely, she was herself damaged and her engines were in poor condition. Coupled with false reports of British reinforcements, the state of the ship convinced Hans Langsdorff, her commander, to scuttle the ship outside Montevideo on December 17, 1939. The Lützow and Admiral Scheer were destroyed by British bombers in the final weeks of the war (April 1945). Lützow was raised and sunk as a target by the Soviet Navy while Admiral Scheer was partially broken up in situ, with the remainder of the hulk buried beneath rubble. For more information about these unique warships click here. This following two-page spread, "Secrets of German's New Pocket Battleship Deutschland and Her Wonderful Engines" appeared in Popular Mechanics in September 1931. Source: longstreet.typepad.com. 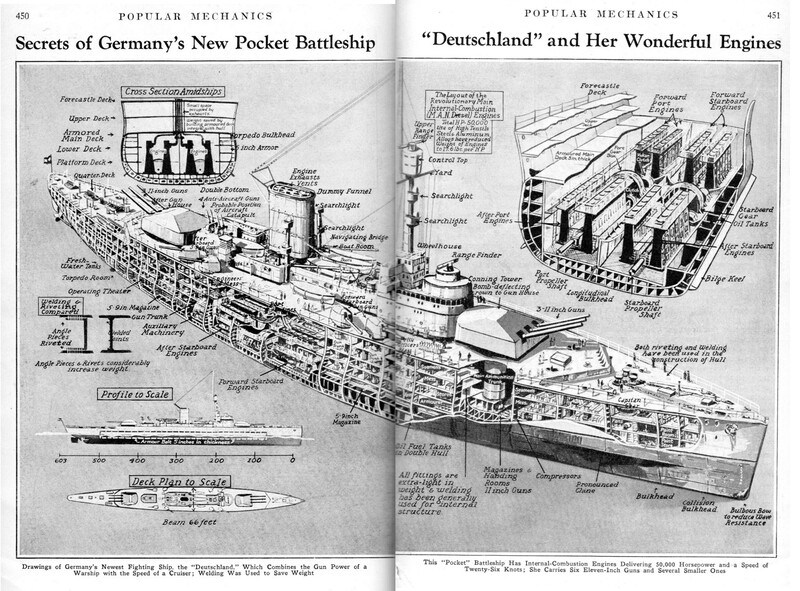 "Secrets of German's New Pocket Battleship Deutschland and Her Wonderful Engines", from Popular Mechanics, September 1931. For a high resolution image click here.